Instead of forming coalitions based statically on robot capabilities, forming dynamic coalition considers environmental influences and dynamic factors. While most previous research on forming coalitions mainly concentrates on loosely coupled multirobot tasks, a more challenging problem is to address tightly coupled multirobot tasks that involve close robot coordinations, which often require capability sharing. General methods for autonomous capability sharing have been shown to greatly improve the flexibility of distributed systems. 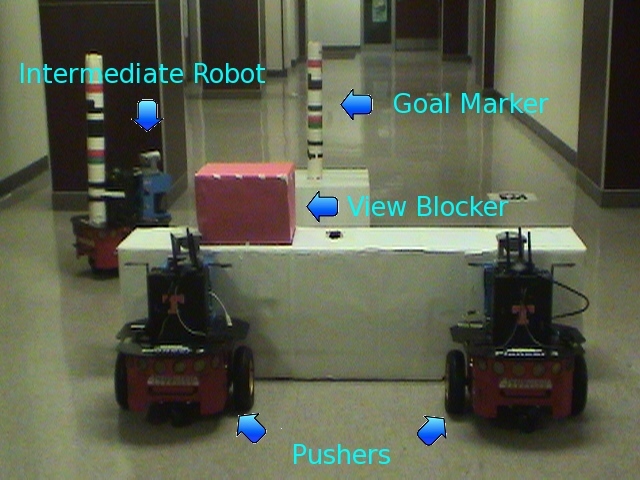 However, in addition to the interaction constraints between the robots and the environment as required by the tasks, these methods may introduce additional interaction constraints between the robots based on how the capabilities are shared. The satisfiability of these constraints in the current situation determines the feasibility of the potential coalitions. To achieve system autonomy, the ability to identify the potential coalitions that are feasible for task execution is critical. We introduce a general approach that incorporates this capability based on the ASyMTRe architecture. The extended architecture, which is called IQ-ASyMTRe, is able to find coalitions in which these required constraints are satisfied. When used to form coalitions, IQ-ASyMTRe sets up only feasible coalitions, thus enabling tasks to be executed autonomously. We have formally proven that IQ-ASyMTRe is sound and complete for forming executable coalitions.